Why is Mold Dangerous?/Is Mold Dangerous? Mold is a basic term used to refer to common fungi that grow in the form of a multicellular structure called hyphae. While some types of molds cause diseases and food spoilage, some play a key role in biodegradation or in the production of different types of foods, beverages, antibiotics, and enzymes. But is mold dangerous to humans? Keep reading to find out. 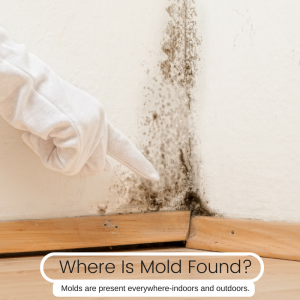 Molds are present everywhere-indoors and outdoors. At the moment, no one knows how many species of mold exist but estimates range from tens of thousands to possibly five hundred thousand more. According to researchers, molds grow best in warm, damp, and humid conditions and normally reproduce by making spores. Many people are sensitive to molds. For these people, exposure to molds usually leads to symptoms such as wheezing, red or itchy eyes and stuffy nose. Some people, such as those with asthma usually have more intense reactions. Severe reactions such as fever and shortness of breath normally occur to people who are exposed to large amounts of molds in their occupational settings. According to studies, a specific type of mold called black mold is responsible for different types of respiratory illnesses. Two types of black mold exist and are associated with the different types of respiratory illnesses. Learn more about how to detect symptoms of mold in your home here. Asthma is a serious health condition which occurs when the airways narrow and swell and in the process produce extra mucus. This normally leads to difficulty in breathing, coughing, wheezing and in some cases death depending on the seriousness of the condition. Many asthma patients, according to researchers, usually exhibit the mentioned symptoms for at least three years after the initial exposure to the dangerous mold. Fungal infections occur when funguses invade the body tissues starting with the skin before spreading into the bones and other sensitive body organs. According to research, fungal infections normally affect a larger percentage of the elderly population who are exposed to Aspergillus. Other victims who stand a higher chance of suffering from such infections include those who have underlying medical conditions such as lung cancer or those suffering from acquired immune deficiency syndrome. According to Centers for Disease Control and Prevention, black mold usually carries dangerous toxins which adversely affect the health of all people who breathe come in contact with the mold or simply breathe in the spores. Allergy type symptoms in this case normally vary from one person to another. Some of the most common symptoms include eye irritation, dermatitis, coughing and nasal stuffiness. Mold has been closely associated with the development of dangerous diseases which affect different parts of the body. These include brain tumors, cancer, stroke, infertility, seizures, memory loss, fever, acid reflux and many other multiple chemical sensitivities. According to research, many of these diseases are normally fatal especially when not taken care of during the early stages.